The Clyde has a long history of fly fishing which has been patchily recorded at best and this is one of the few books available to fill the gap. 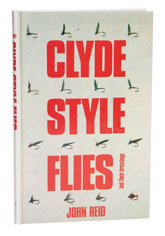 Clyde style flies are characterised by slender dressings set off by wings set on far more upright than is usual; as a result of which they have more in common with flies of the Middle Ages than Scottish loch flies, which are largely based on the nineteenth century style. This makes the Clyde style interesting as one of the few regional schools to survive relatively unadulterated by post-Ronalds revisionism – not to mention the fact that the patterns work pretty well. The book weighs in at under a hundred pages, much of which is taken up by a list of patterns, but there is a helpful section on how to fish the Clyde style and other general advice on tactics. This is by no means a modern fly tying book, so don’t expect step-by-step illustrations and some of the materials are relatively hard to come by these days. There are two colour plates of which the least said the better, and though they do give some idea of what the patterns should look like, I wouldn’t bet the farm on tying an adequate fly by reference to them alone. The prices quoted by the author all relate to the early seventies, when a fly line cost three quid and the text has a distinct late Victorian flavour (though sadly, without any reference to ‘brothers of the angle’), but Clyde Style Flies is none the worse for this and I was certainly pleased to read it.